If I was to sum up my weekend in just one sentence it’d be: Did it really happen? Or: boy, that was fast! Unlike my last weekend when I had to work all of Friday [think: until midnight] and half of Saturday this one had come with the premise of being calm and uneventful. Not so much in hindsight but I’m not complaining. Let’s recap some of the marvelous happenings from the past two days with our host Katie. Bonus points if you can spot the sea gull in this picture. Because traveling requires some good fuel I packed a lot of food and also tried a new-to-me snack: a Nākd bar. More on these to come soon once I’ve sample some more flavours. I’m not easily convinced when it comes to bars but this one was delicious. In between reading and enjoying the scenery time fortunately passed by fairly quickly on my way there. Once I’d arrived my mum and I headed to a café located right by the seaside. Note to self: pack both sunglasses and a light scarf next time because seaside in summer = lots of sunshine and a “steife Brise” as any Northern German would say [overall windiness for all others]. Some more walking around the city ensued but I didn’t take any other pictures of the scenery because when I’m with my mum my phone doesn’t get much attention. Quality time with my mum > being a good blogger taking pictures. Rather, I’ll leave you with this random non-vegetarian 😉 bit of hilariousness that I found in a book store while waiting for my train later that day. That’s what you happen upon when your train back unscheduledly ends prior to reaching your destination and you have to wait for a new connection. Thanks for nothing, German railway system… [note that it’s basically a requirement to snark at the ‘Deutsche Bahn’ as a German because delays are a daily order of business]. Sunday started with leisurely sleeping in – blissful! After some pottering around my apartment, a quick reading session to my second recommended reading place – aka: the gym – and a delicious lunch I headed out to the movies. Following the spontaneous invitation of a friend we went to see ‘The Fault in our Stars’. I’d read the book way back and actually hadn’t planned on watching the movie but wasn’t going to say no when my friend suggested it. Looking back I’m glad she asked me to tag along. In between being out and about all Saturday and not sitting down much on Sunday, either, this the weekend flew by in the blink of an eye. Leaving me thinking that this thing called ‘just living’ feels pretty good. More of that, please. Happiness inducing today: Just all of today. What are some of your [unusual] favourite places to read? 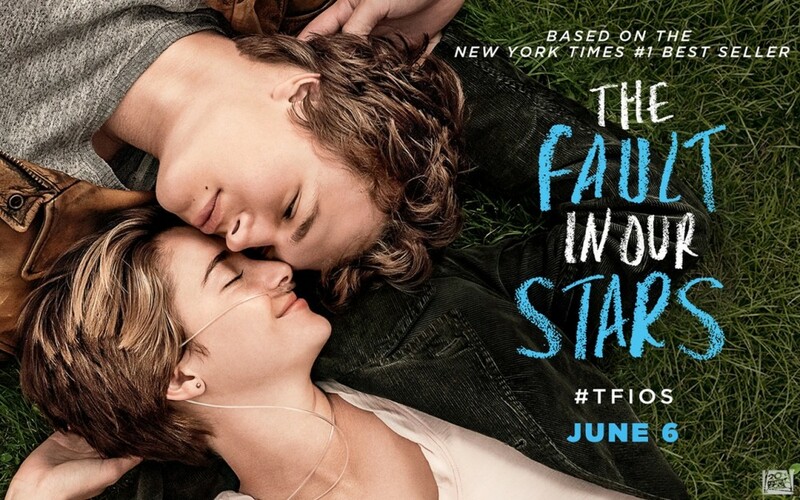 Did you watch ‘The fault in our stars’ yet or plan to do so? Tell me your favourite part of this past weekend. Looking back at the past days I honestly have to assume somebody’s pushing the fast-forward button when it comes to the weekend and slow-motion on weekdays. The past days were packed with activities but I still didn’t get to check off all [fun and not-so-fun] points on my weekend to-do list and now it’s already back to the grind again. Oh well. No matter how manic our Mondays might be, however, there’s always the weekend to look back at some marvelousness. And if that doesn’t help to cheer you up think of it this way: we’re already well on our way to another weekend ;). Okay, so it was just my mum and me watching the movie. But – at the risk of sounding biased – I’m pretty sure it wasn’t my dad’s kind of movie in anway. Don’t you agree? We watched Stuck in Love and I highly recommend it. I’d actually never heard of the movie before and planned on getting Love, Actually. But when I spotted this one at the rental store it just wanted to come along and so it did. The beginning made my mum laugh out loud and ask what kind of movie I’d picked. Luckily, she’ll watch pretty much anything and it ended up being a great one. Perfect for a mum-and-daughter or single girl movie night. With a side of my favourite snacks: Erdnussflips. I’ve mentioned these before and though my mum once claimed she and my dad didn’t enjoy them much they’ve somehow become a staple since I moved in. Sweet coincidence?! Did I mention my mum’s unusual style of decorating yet? While our house sadly isn’t nearly as festively decorated as in past years my mum puts up cute little figurines, ornaments and vases filled with flower arrangements all year. Mostly seasonal or all-year-round suitable ones so let’s agree that the bunny is there to help the dwarf cheer up the slightly unhappily looking Santa, okay? Something that hadn’t happened in ages anymore. My mum claims she didn’t enjoy them so I’d given up suggesting to play board games – when my dad suddenly asked if I’d like to because he had some more time this weekend. Needless to say I was game! Seeing how long we hadn’t been playing this game anymore my parents had completely forgotten the rules. It was my job to keep my eyes on them to prevent [most] cheating but some slipped my view. Do anybody else’s parents keep helping each other while you’re playing on your own? Not fair. A good part of my weekend was once more spent writing [long-overdue] letters. Accompanied by a new toffee-scented candle it was most definitely happiness-inducing. What can I say? I’m five at heart and get excited at the sight of cute little stickers like these ones. But honestly: Wouldn’t you prefer to receive letters covered in reindeers, santas and other holiday-themed ornaments, too? White paper is a sad sight that should only be left for business letters. It’s time to say sorry. If you read my review of Happy Herbivore Light & Lean you might remember me mentioning a giveaway coming up. And it only deemed on my yesterday that I’d promised to have it up last week already. So: sorry! No more delaying now, though. For a chance to win your own copy become a member of the family of Happy Herbivore Light & Lean owners leave a comment through the Rafflecopter widget [link below] telling me why you’d like to win the book. The giveaway is open to US and Canadian readers only [sorry!]. Happiness inducing today: My dad approving of the [vegan] family dinner I’d prepared. Does your family still have game nights when you meet? Which are your favourite games? What were some of the last great [romantic] movies you watched? Are you a fan of decorating all year round or just seasonally for the holidays? I hope you all had a lovely weekend and what better way to start the week than with another day off?! Now that’s a case of the Mondays I could get used to … And which better way to celebrate the happiness than with Katie’s Marvelous in my Monday? Thanks for hosting, Katie! While I wish I could pretend elsewise we did indeed get a white Easter as predicted. It wasn’t a reason to fret, though, as I got to spend the weekend at my parents’ enjoying a nice walk through the white. Plenty of sunshine amidst the white made up for the snow still being present. Our try on bird-watching: The cranes were frightened so we had to stay in the car. Can you spot them in the distance? Long promised and now finally happening: Cake! I know Amanda might have given up hopes on me ever having it already. I’d been meaning to prepare one for weeks months – whenever visiting my parents in between my birthday and now – yet there was always fortune getting in between. Either my mum or my grandma would have already whipped up a [non-vegan] cake not leaving any desire for more. Maybe I was even happy for it not happening as I can’t deny I was still afraid: Too many extra calories, I wouldn’t be “allowed” to have any other sweets that day, what if it didn’t taste as good as I hoped? The list would go on endlessly. Preparing this no-bake cake on Saturday night I couldn’t hide my excitement to try a piece on Sunday, though. Because there was also hope I’d be blown away by its tastiness and happy being able to finally say I’d eaten a whole piece of cake again. Let’s say it right away: The cake looked better than it tasted. Don’t get me wrong, it wasn’t awful but the cream base could definitely have used more flavour while the crust was really good. Still, I ate the whole piece without regret. And that actually makes this cake experience a huge success: Not too long ago I’d have been incredibly disappointed eating something that didn’t satisfy me completely. I’d have considered it a waste of calories and grieved it. Now, though? Well, it wasn’t great but that’s okay. It didn’t make me skip the chocolate notoriously eaten on Easter or – who would I be to deny the fact ;)? – every day. Despite my expectations my mum did indeed get me a (vegan dark chocolate) Easter bunny. The little guy above survived Easter, though, thanks to my mum having thoughtfully bought me a bar of Lindt 85 %, too. Your luck, Easter bunny, but you still won’t get away :D.
Ending the weekend on a funny note my mum and I watched Tangled. Sunday evenings are usually reserved for my mum’s crime thrillers [the famous German “Tatort” movies in case you’ ve heard of them before] which I’m not keen on. 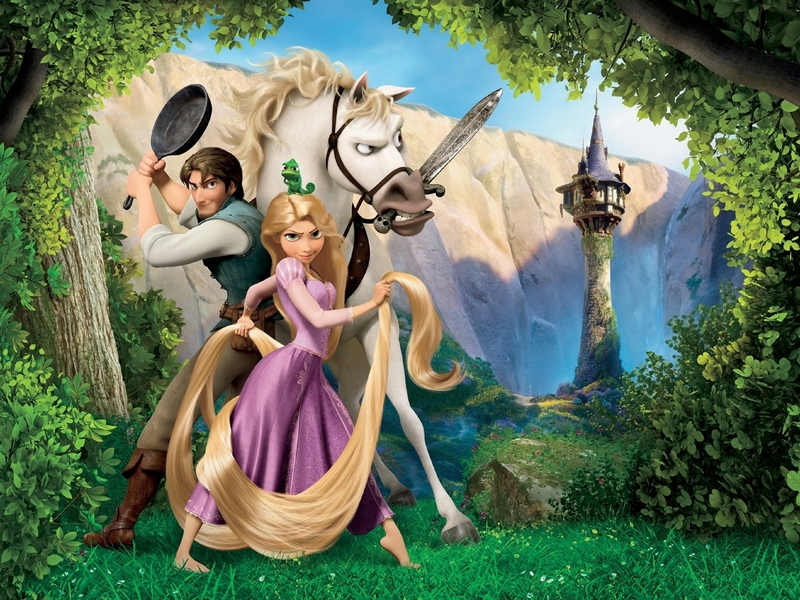 Tangled was a fantastic alternative having both of us laugh out loud and enjoy the cutesy of the characters. Nothing like a bit of Disney to end the night, right?! Whom did you spend Easter with and what did you do? Which is your favourite Disney movie? … by watching Christmas movies again. Today’s going to be a short post because I’m tired after a two-day seminar in university – not exactly the best way of getting me into the Christmas spirit ;). But I wanted to join Jenny’s Christmas Challenge so there you go! Oooh, that’s a good one already – and an easy one as well. Though I can’t say I had seen too many Christmas movies so far I already have a favourite: Love, actually. Come on, how could you not like a movie starring all of the great British actors from Hugh Grant and Keira Knightley to Alan Hickman, Emma Thompson, Colin Firth and Rowan Atkinson? And let’s not forget about the stories showing all aspects of love from funny, sad, playful to – obviously – romantic. “Love, actually” displays love in all stages of life: a shy little boy trying to impress his first crush, the secret love of a man to his newly-wed best friend’s wife, intercultural love and the love between a prime minister and the girl who serves his tea. I’m generally a huge fan of movies starting out in several different stories that merge into one in the end. There were a few of the single stories I liked better than others but it all evens out. It’s hard to keep the content of the stories to myself but I don’t want to give too much away in case you haven’t seen it. If you haven’t: Watch it! You can thank me later :D. Oh, also: It’s best watched with friends while eating chocolate fondue – trust me, I know from experience. Have you seen “Love, actually” before? Did you like it? What’s your favourite Christmas movie? I’m open to suggestions!